Gary writes: The first and second floors in our house seem overly bouncy and sag toward the middle. How can we evaluate whether the floors need reinforcement and, if so, what is the best way to do this? Steve Bliss of BuildingAdvisor.com responds: If the floor is sagging visibly in the middle or is very bouncy, you may want to reinforce the floor to eliminate the sag and reduce the bounciness (for example, dishes rattling in a cabinet when you walk by). This is common in old houses and is usually more of a nuisance than a safety issue. Still it is a good idea to have the problem evaluated by an expert, such as a structural engineer or experienced contractor. It should only take an hour or so of his time — ask ahead of time what the cost will be to evaluate the problem and recommend a solution. Bounciness is usually caused by undersized floor joists. Sagging can be the result of undersized joists, an undersized support beam, or support posts that have rotted at the bottom or settled into the ground. Other causes can be joists that were notched or drilled in the wrong place (see our Guide to Notching and Boring Joists) or are weakened by decay or insect damage. Any moisture problems that contributed to decay in the structure should be addressed before making structural repairs. Then rotten or damaged joists can be repaired or replaced, as needed. Assuming the joists are in good condition, the solution to both sagging and bounciness problems is to reinforce the floor. Depending on cost and practicality, they could mean beefing up the floor joists, or adding new support underneath with new or reinforced posts of support beams. A small amount of sag in joists under a load is normal “deflection.” A large amount of sag that has permanently set into the wood is called “creep.” To repair this type of sag, the wood must be very slowly forced back to level, typically using hydraulic or screw jacks pushing up on a temporary beam. This is done slowly over a day or more to minimize damage to flooring, plaster, and other finishes. The same approach can sometimes be used to straighten a sagging beam if the deflection is not too great. Once the sag is removed, the floor will need to be held in place with a new or reinforced beam. In a basement or crawlspace, posts can be placed along the beam to support it. The posts must rest on properly sized concrete footings to prevent settling. If adding posts is not an option, then you may need to add a larger beam supported only at the two ends. This could be made of wood, engineered lumber (LVL), or steel. If you are able to straighten the support beam with a jack, and don’t want to replace it, another option is to reinforce the straightened beam with a steel flitch plate. 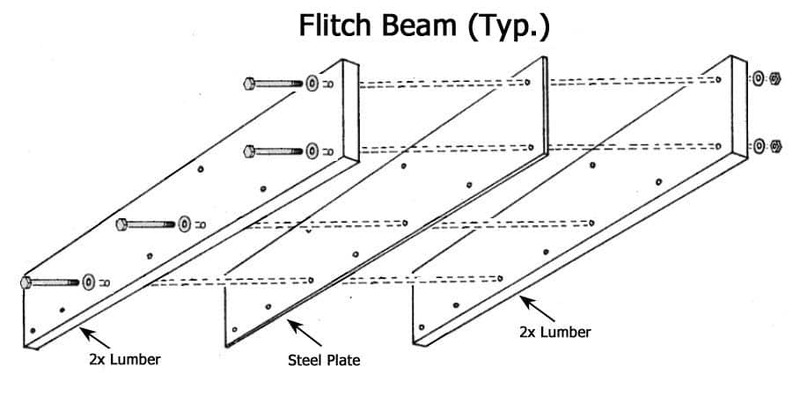 A simple flitch beam sandwiches a steel “flitch plate” between two wood joists with staggered bolts. Flitch plates. Existing beams can be reinforced by bolting one or more long pieces of ¼ or ½-in. 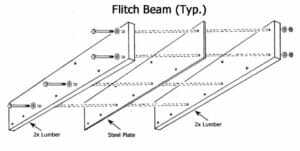 steel plate, called a flitch plate, along the length of the beam. Short flitch plates of steel or LVL can also be bolted on both sides of a joist to repair a cracked or damaged section. Sistering. Where sagging is not the main problem, bouncy joists can be stiffened by “sistering” a new wood or engineered-wood joist alongside the existing ones. Attach the sisters to the existing joists with nails, screws, or bolts (bolts are best). Sistering is similar to adding a flitch plate, but typically uses framing lumber rather than steel or engineered lumber. Solid blocking. If you have access the joist spaces from below, adding solid blocking between the joists at 4 ft. intervals will help stiffen the floor. If the joists are damaged or undersized, blocking will not usually be sufficient to solve the problem. But it will help in combination with sistering or plywood facing, as described below. Add plywood below. Many years ago, I contracted a remodeling job where the plumber cut a series of deep notches in the tops the floor joists, right across the middle of the span. Notches should never be made in the middle third of the span. The floor had started to sag and the plaster ceiling below was cracking. We brought in a structural engineer who had us remove the plaster ceiling below and reinforce the entire ceiling with heavy plywood sheets screwed and glued to the joists, creating a diaphragm — essentially a huge box beam. Above each notch, we also added a rigid steel strap. Adding a beam or posts below (in the living room) was not an option. Which solution is best for your project will depend on the cause of the problem, access to the framing, and whether adding beams and posts is a option. Best to get an experienced contractor to do the work. How to Build Bedroom Above Bouncy Ceiling Joists? We have a large bedroom on the second-story above a large bedroom on the first floor (each about 12 x 18 ft.) The downstairs bedroom ceiling has cracks and moves visibly when someone walks upstairs. The upstairs is currently used for storage, but we want to make it our bedroom. 1) The downstairs floors are hardwood and I don’t want to crack them. 2) The downstairs bedroom has a ceiling light fixture right in the middle of the room, where the sagging is worst. 3) A brick wall that runs beneath the center of the downstairs room (in the basement),but it is old, and I’m not sure if it is can support the jacks. Is there any good way to prevent us from crashing through the upstairs floor, without tearing the house apart? From your description, it sounds like the floor joists are significantly undersized. In the table below, you can see that the floor joists for a 12 ft. span should be 2×8 or larger for typical framing lumber (in this case, #2 SPF). If the space above was originally intended for storage only, the joists may be 2×6 or smaller. Without the specifics, it’s hard to say how much additional support you will need. Adding beam across the middle of the floor, perpendicular to the joists, would be the easiest solution if you don’t want to tear up the ceiling. The beam could be supported by jacks (or posts), as you describe if you don’t mind having posts in the middle of the existing bedroom. This solution will cut the joist span in half. Jacks are not intended to be used as permanent supports, so it is best to replace them with wood posts. Whether you use jacks or posts, you will need to carry the load from the first floor to the foundation. Whether your old brick wall will support the load is hard to say. If the brick or mortar is crumbling, then you may have problems with this approach. Also, some older bricks are very soft and not intended for structural applications. If you use a large enough beam, you will not need any posts along the span. In that case the beam will need to be supported at each end by wood posts. You can use solid posts, such as 4x4s or 4x6s or build them up from 3 or more 2x4s nailed together. This will involve opening up the wall at each end to install the posts. You will then need blocking below the posts (between the sill and subfloor) to carry the load to the foundation wall. To size the beam, I recommend having an engineer take a quick look. Depending on the load and type of lumber, you would need a built-up beam made of 3 or more 2x10s or 2 to 3 2×12’s if you want to use standard dimensional lumber. With engineered lumber or steel you will be able to design a shallower beam that will intrude less into the room. In both cases, you will need to follow the prescribed schedule for size and spacing of the fasteners used to make the built-up beam. In some cases, you can provide enough added stiffness by nailing and gluing plywood to the underside of the floor joists, turning the floor joists into large box beams. This would require that you remove the drywall or plaster to get a solid connection between the plywood and the wood joists. Adding a layer of plywood on top will add greater strength and stiffness. Again, you would need to get an engineer’s input on whether this is feasible , as well as the plywood thickness and nailing schedule. This advice is only intended as a starting point for your research. Since I do not know the actual loads, materials, or condition of the existing construction, I can only make an educated guess, and am not licensed to do structural engineering. If it were me, I would spend a couple of hundred dollars to get an engineer’s professional opinion rather than winging it. Best of luck! Last year I had a leak from the toilet on the second floor repaired and at that time the floor was taken all the way down (there were three layers) and a new tile floor installed. I knew that the floor outside the bathroom sagged to the right but now is even more pronounced. I have not been able to use the shower in years as that leaks. I would have redone the entire bathroom at that time but my plumber was way too costly. For a tiny bathroom the fee was approx $30,000. This may have been a blessing in disguise. Could the beam be rotted from a leak from a previous homeowner and that’s why the floor slants down (very noticeable)? What is involved in this type of repair and what is an approximate time frame? Bathroom is over my dining room. It’s certainly possible that the slope in the floor is caused by wood decay caused by the leak in the shower and/or the leak from the toilet. However, I can’t be more specific about the cause of the problem or cost and time-frame to fix it. There are just too many variables and this type of work is very specific to the particular building, how it was framed, and what components need to be repaired or replaced. Assuming a water leak caused the problem, the leak would also need to be repaired, whether it is a plumbing leak or water entering from the exterior, for example, through a faulty roof flashing. Above a bathroom, you may have a plumbing vent that goes up through the roof, a common point for leakage. getting the opinion of a third party who is not bidding on the job – this could be an architect, engineer, or home inspector with extensive experience with residential building rehab. To fully understand the problem, you or your contractor/consultant may need to remove some plaster or drywall in the area where the floor joists have dropped to visually examine the structural details and the damage. It’s good to compare notes from one expert to the next to see if there is general agreement on the problem and solution. The fact that the slope in the floor is worsening implies that the wood decay (if this is the cause) is continuing. This means that water is still being supplied to the area of wood decay. Without a source of water, the fungal growth that causes rot would stop. If you had an ongoing leak, you would probably notice water stains on the plaster or drywall ceiling near the area of the leak. It is also possible the beam or bearing wall that supports the sagging floor has settled for other reasons such as framing errors, undersized posts, or uneven settling in the foundation. This should become clear, once you’re able to get a good look at the area of settlement. As for the cost and time involved in this repair, it will be significant. If the building is now stable, or can be stabilized, it may be possible to remove the flooring, add a leveling compound to the subfloor and replace the flooring or add new flooring. This would be a much cheaper solution, but could cause problems at doorways or junctions with other rooms. I have a kitchen floor that bounces whenever we walk on it. The area in particular is in the center of the room, between the fridge and the dishwasher. It’s a span of 10 feet. The basement is finished and I don’t want to tear out the dry-walled ceiling. Would screwing another sheet of plywood stiffen it up? If so, what thickness? The best way to reduce bounciness is to add support from below (a beam or load-bearing wall) or to reinforce the joists if they are accessible. Solid bridging can help, but “sistering” new joists alongside the existing joists is much better. Adding support from below is also very effective. Shortening the span by adding a center beam or load-bearing wall will stiffen the floor dramatically. Even building a closet along one wall in the basement that shortens the span from 10 ft. to 7-8 ft. could help a lot. Adding a layer of plywood to the underside of the joists can also be very effective as you are turning the floor into a giant box beam. Use 5/8-3/4 in. plywood with construction adhesive and screws that penetrate the framing by at least one inch. Orient the plywood as described below. Adding plywood above, as you plan to do, can be moderately effective. I would start be refastening the existing subflooring with subflooring screws or decking screws that penetrate the framing at least one inch. The standard fastening schedule for subflooring is 6 in. on-center around the edges and 12 in. on-center along each joist. Since you are trying to stiffen things up, however, you should reduce the fasteners to no more than 6 inches on center throughout. To get the maximum benefit, laminate the new layer of plywood to the existing plywood (after cleaning it and sanding it with 60 to 80-grit paper). Use yellow carpenters glue spread evenly across the whole surface — not construction adhesive which will leave gaps between the beads of glue. Orient the new plywood panels along the length of the joists to help stiffen the span, and offset the joints from the existing plywood joints by at least 6 inches. You want the full sheets to be more-or-less mid-span, so a staggered pattern of 8 ft. sheets and, 2 ft. sheets should work well. Tongue-and-groove subflooring will give you the stiffest floor. Use a 1/8 in. glue bead on the joints, which are designed to leave a 1/8-in. gap. Otherwise, you will need to gap the joints yourself. Attach the new subflooring to the joists with screws long enough to penetrate the joists by at least one inch. The screws should be no more than 6 in. on-center. Also screw the new layer of subflooring to the existing subfloor between the joists. Use screws long enough to penetrate both layers of plywood. Place these screws at 4 to 6 in. on-center in both directions. As for what thickness of plywood, I would use the thickest layer you can use without causing problems at doorways and threshholds. A total thickness of 1-1/8 to 1-1/4 in. of plywood is recommended for most types of finished flooring, but you may need more than this to compensate for undersized floor joists. If you have the space, I would use 5/8 – 3/4 in. plywood. If you are planning to install ceramic tile or vinyl, you may need another thin layer of underlayment on top of your thickened subfloor, so make sure you take that into account when choosing the plywood thickness. I found this metal X Brace that made my floor like concrete. I put the metal I-joists braces 5 to 7 feet apart and had no issues after that.